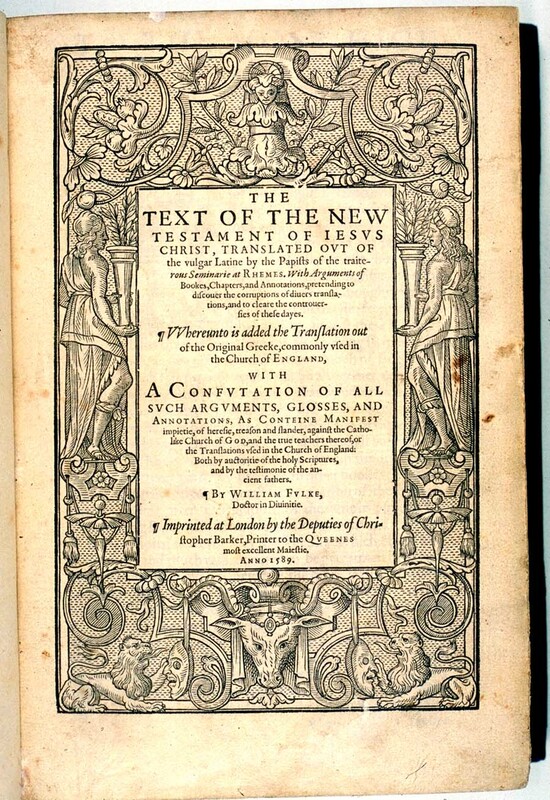 William Fulke was an Anglican clergyman who undertook the task of refuting the comments made in the notes of the Catholic New Testament printed at Rheims in 1582. His method was to print a parallel version of the Rheims and Bishops’ text. He then printed all the notes from the Rheims version with his own comments and refutations. 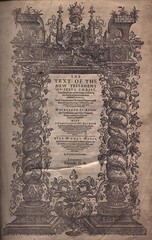 One consequence of this book was that the Rheims New Testament became more available in England than it might otherwise have been; and King James’ revisers were influenced by the Rheims New Testament. Title: The Text of the New Testament of Iesus Christ. With a Confutation by William Fulke. 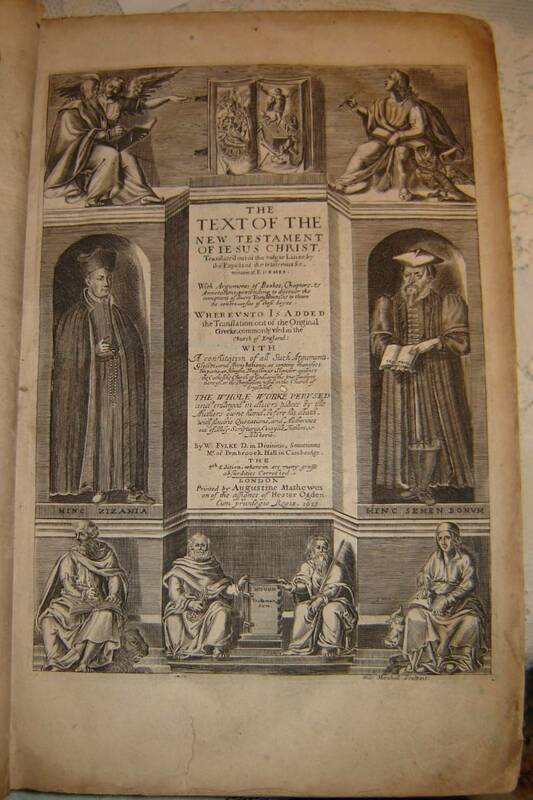 London: Deputies of Christopher Barker, 1589. 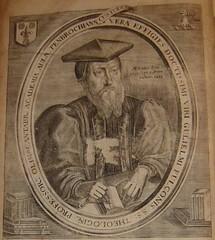 Description: Folio. 524 leaves (, 496 leaves,  pages), 10¾ × 7½ inches. Roman and italic in various sizes. The Rheims New Testament (1582) and the Bishops’ version (1568) in parallel columns, with Rheims annotations and Fulke’s confutations. 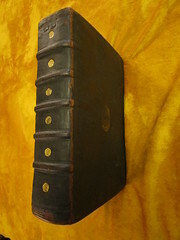 Bound in 18th-century brown calfskin, repaired with gilt border; spine gilt, 2 dark red morocco labels. Location: Cited copy is located at the Perkins School of Theology, Southern Methodist University. 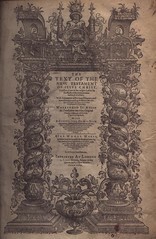 Recent Sales An imperfect copy of this edition lacking the title page sold on Ebay on October 14, 2009 for $1,584.85. (eBay item #230385796404). Another copy sold on Ebay for $1,900 on January 9, 2012 (Ebay item #200698406103). 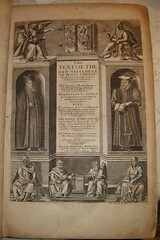 The same copy sold again for $2,850 on Ebay March 15, 2012 (Ebay item # 270931167060). 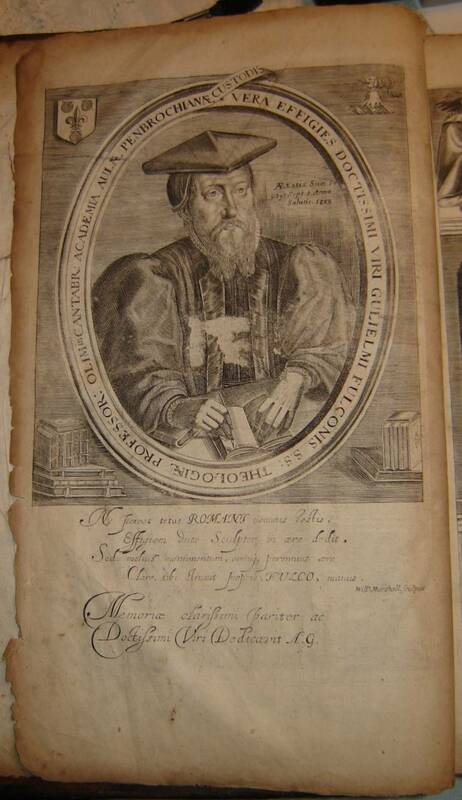 Another copy with a facsimile title page sold on Ebay for $2,699 on March 20, 2014 (Ebay item 221394500474). 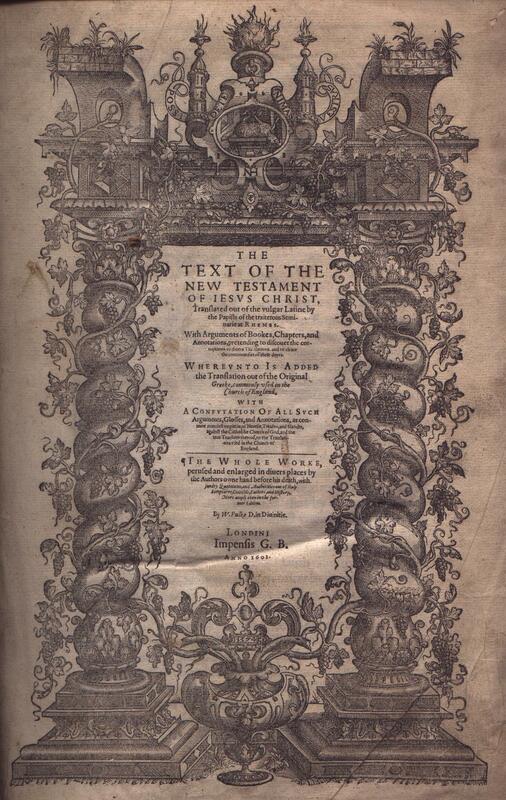 Title The / Text of the / New Testament / of Iesus Christ, / Translated out of the vulgar Latine by / the Papists of the traiterous Semi- / narie at Rhemes. / With Arguments of Bookes, Chapters, and / Annotations, pretending to discouer the cor- / ruptions of diuers Translations, and to cleare / the controuersies of these dayes. / Whereunto is Added / the Translation out of the Original / Greeke, commonly vsed in the / Church of England, / With / A Confvtation Of All Svch / Arguments, Glosses, and Annotations, as con- / teine manifest Impiety, or Heresie, Treason, and Slander, / against the Catholike Church of God, and the / true Teachers thereof, or the translati-/ ons vsed in the Church of / England. / The Whole Worke, / perused and enlarged in diuers places by / the Authors owne hand before his death, with / sundry Quotations, and Authorities out of Holy / Scriptures, Counsels, Fathers, and / Historie. / More amply then in / the for- / mer Edition. / By W. Fvlke D. in Divinitie. / Imprinted at London / by Robert Barker, Printer to the / Queenes most excellent Majestie. / Anno 1601. 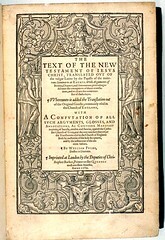 Contents A parallel New Testament including the Rheims Version of 1582 and the Bishop's Version of 1568. Annotations from the Rheims Version are included and "confuted" by Fulke. 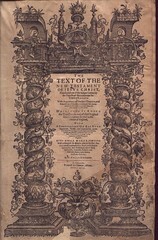 Comments A folio reprint of the 1589 edition. Recent Sales A copy of this edition sold on Ebay for $1,292.89 on May 12, 2014 (Ebay Item No. 351063195913). 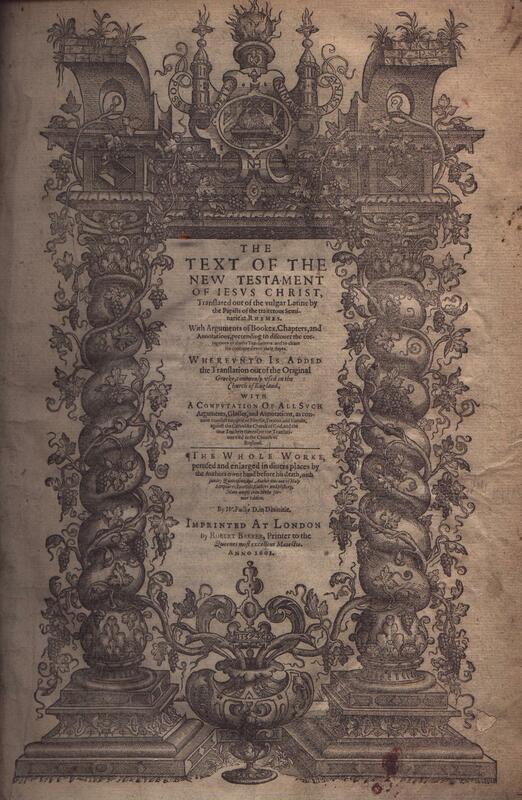 Title The / Text of the / New Testament / of Iesus Christ, / Translated out of the vulgar Latine by / the Papists of the traiterous Semi- / narie at Rhemes. / With Arguments of Bookes, Chapters, and / Annotations, pretending to discouer the cor-/ ruptions of diuers Translations, and to cleare / the controuersies of these dayes. / Whereunto is Added / the Translation out of the Original / Greeke, commonly vsed in the / Church of England, / With / A Confvtation Of All Svch / Arguments, Glosses, and Annotations, as con- / teine manifest Impiety, or Heresie, Treason, and Slander, / against the Catholike Church of God, and the / true Teachers thereof, or the translati-/ ons vsed in the Church of / England. / The Whole Worke, / perused and enlarged in diuers places by / the Authors owne hand before his death, with / sundry Quotations, and Authorities out of Holy / Scriptures, Counsels, Fathers, and / Historie. / More amply then in / the for- / mer Edition. / By W. Fvlke D. in Divinitie. / Londini / Impensis G. B. / Anno 1601. Comments A reissue of the above edition with a different publisher's imprint. Title The / Text of the / New Testament / of Iesus Christ, / Translated out of the vulgar Latine by / the Papists of the traiterous Se- / minarie at Rhemes. / With Arguments of Bookes, Chapters, and / Annotations, pretending to discouer the corrup- / tions of diuers Translations, and to cleare the / controuersies of these dayes. / Whereunto is Added / the Translation out of the Original / Greeke, commonly vsed in the / Church of England, / With / A Confvtation Of All Svch / Arguments, Glosses, and Annotations, as con- / teine manifest Impiety, or Heresie, Treason, and Slander, / against the Catholike Church of God, and the / true Teachers thereof, or the transla- / tions vsed in the Church of / England. / The Whole Worke, Pervsed, / and enlarged in diuers places by the Au- / thors owne hand before his death, with sundrie / Quotations, and Authorities out of Holy / Scriptures, Counsels, Fathers, and / Historie, more amply then in / the former Editions. / By W. Fvlke D. in Divinitie. / London. / Printed for Thomas Adams. / Anno 1617. Comments The second folio reprint of the 1589 edition. Recent Sales A copy sold on Ebay for $1,528.99 on May 11, 2008 (item No. 130220205290). Comments: This a parallel edition of the New Testament of the Rheims and Bishop's New Testament. 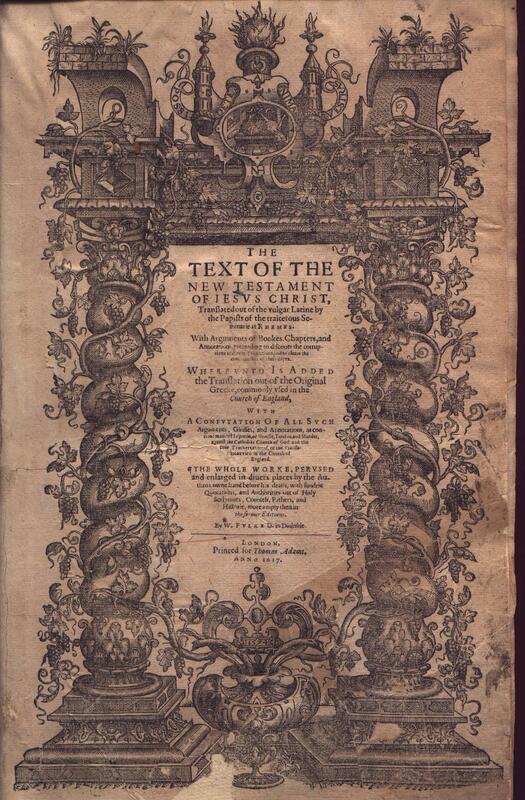 It reprints the notes of the Rheims New Testament with the comments of William Fulke.